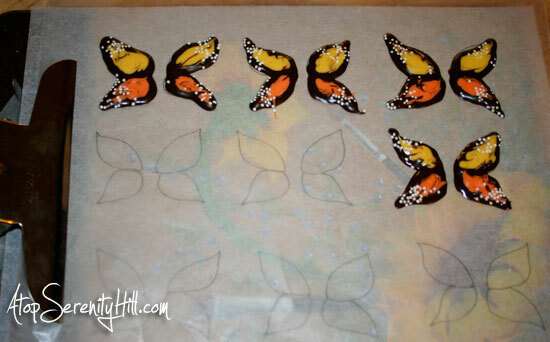 After baking the mini chocolate cupcakes and setting them aside to cool completely, I started making the butterflies. I drew a wing shape on a piece of tracing paper (regular paper is fine), attached it to a clipboard and added a piece of wax paper over it. This gave me a pattern for 9 butterflies at a time on a hard surface that fit easily into my frig. After following the directions on the Wilton packaging on how to correctly melt the chocolate, I was ready to go with all three bags of my melted chocolate. FYI…the yellow and orange definitely took longer to melt than the dark chocolate. I cut a tiny piece out of the tip of the decorator bag. Start small…you can always cut more away. Tip: depending on how fast you can work, you might want to do half a wing at a time as the chocolate is hardening as you go. Experiment first to figure out the best way for you. I messed up a few at first, but I ate all the evidence! 1. Using the dark chocolate first, pipe out the shape of the wings. 2. 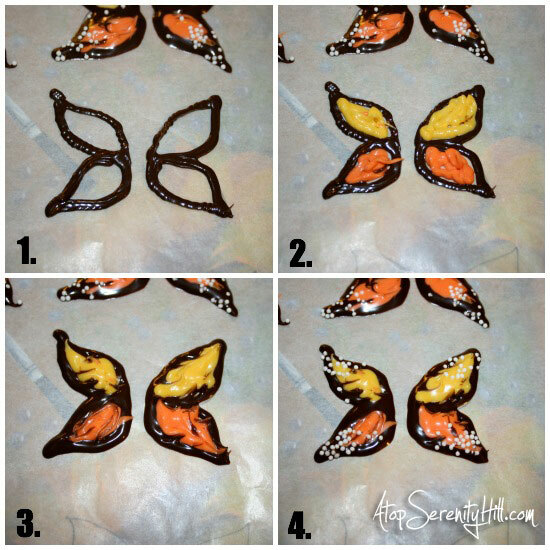 Add yellow chocolate to the top part of the wings, orange to the bottom. Be pretty generous so that it fills in the space. Tap on your surface (mine was my clipboard) to spread the chocolate out. 3. Use a toothpick to lightly pull some of the dark chocolate into the colored sections to create a marbling effect. You can then tap the surface again to spread the chocolate a bit more. 4. Add a sprinkle of nonpareils to the edges of the wings. When all 9 are done, put your surface into the refrigerator to harden the wings. Here’s what my refrigerator looked like during the process!! You do not have to harden the chocolate in the frig. It will harden on its own just be sitting out. However, I wanted to speed up the process. 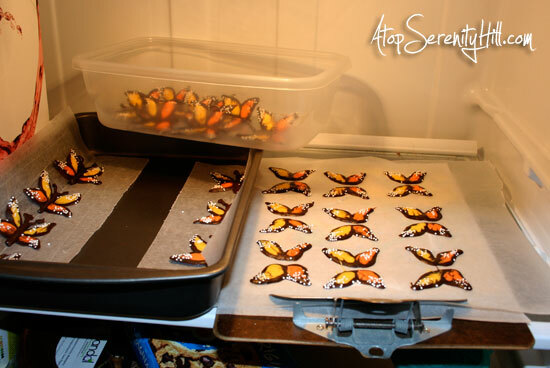 To create the body of the butterfly and “glue” the wings on, I put a piece of wax paper on the side of a baking pan. I piped a body and antennae into the corner of the pan on the waxed paper and then placed the hardened wings into the soft chocolate. The butterflies went back into the frig to harden. Cream the butter and add 4 cups of sugar, milk, vanilla and salt. Beat until creamy, adding remaining sugar gradually until desired consistency is reached. This recipe makes A LOT of icing. I only used 1/2 of it for the cupcakes. 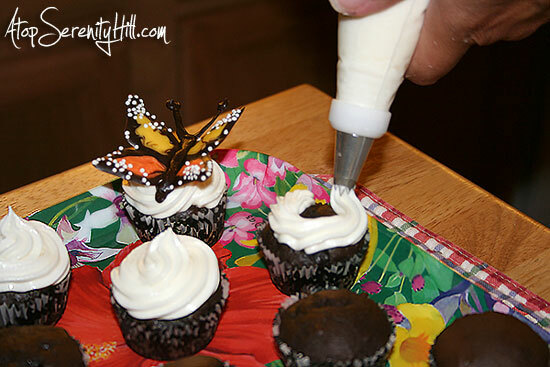 I used a #21 piping tip to add the icing and placed the finished butterflies on top. The event I made these lovely creations for was an end of the summer party. I had a large tray to carry them over to my neighbors house which made a great presentation! Monarch butterflies were migrating at that time, so the presentation kind of resembled that event! I hope you will try your hand at these adorable and tasty cupcake toppers. I think they would be a great addition to your Thanksgiving dessert table. I want to give credit to the blog I got this fun idea from…you can find her tutorial here. And did you know?? You can learn the Wilton way of cake decorating right on Craftsy! Check out the entire Wilton series with Beth Somers here! When I first saw the picture I thought “There’s no way I could do that” But you’ve made it look so simple I must try this now. Thanks for sharing!! Thanks for saying that, Steph! I always glad to hear that my directions broke down the steps enough for you to just go for it!! Good luck! Love these! Shows your talent…..as always. These are stellar! I love how you show how simple such a beautiful and stunning project can be! These are the prettiest cupcakes ever! I’m stopping by from Show Stoppers! Thanks, Tahny! I popped on over to your blog to pin the sweet potato wedge recipe! Looks amazing! So pretty! I’ve done something similar using royal icing, but I like the idea of using candy melts so much better!! How pretty! You did a great job! Oh my! These are so super creative! My 6 yr old son has really been into butterflies this week…and he’s looking at this in total amazement! You are so talented. I’m so happy you shared this at the link party today! Already pinned. It is a pretty easy project and something you could do together. Thanks for visiting! Would you like share it at the Foodies & Crafties Soirée? There is one live now – http://goo.gl/5qxIWI? Thanks, Gosia! 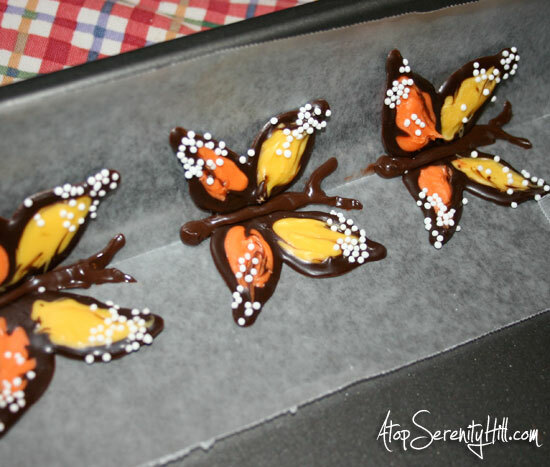 I actually ran across your fruit butterflies when I was researching the chocolate ones! Very pretty. Thanks for invite and I have linked on up! Wow, these are amazing…so beautiful! Pinned! Thanks for the pin, Susan! I hope you give them a try. These are beautiful (and delicious-looking)! My mother has a huge affinity for monarch butterflies and always raised monarch caterpillars into butterflies with her students. She is retiring after this school year, and I do believe these cupcakes may need to make an appearance at her retirement party! Stopping by from Hoyby Crafts, courtesy of the Flamingo Toes link party (Ribbon Turkey Vase). Thanks, Shannon! That would be great if you make them for your mom! She will love them I am sure! Happy week! These would be great for a little girl’s birthday. I might have to try it! Stopping by from MakingTheWorldCuter party and your butterflies are absolutely AMAZING!!!! Thanks for stopping by, Carrie and for the compliment! Thanks, Kayla! I will be sure to stop by. They look as if they are going to take off in flight- what treasures! Thanks for sharing at the Foodies and Crafties Soiree! What a wonderful compliment, Sarah! Thanks for visiting! Beautiful! I pinned this great tutorial. These butterflies are just darling – love them!! Stopping by fromt he Cropped Stories. Those are so lovely. Going to pin them and make them in the spring! Thanks, Marie! So glad to have inspired you! Hello Consie! I ran across your blog on the “Pin It Monday Hop”. I’m so glad I did. I love these cupcakes! I have to try it so I bookmarked it. I’m following you via Bloglovin’. Please follow me back and have a great day! Hi Vashti! Thanks so much for visiting! I hope you are able to try making the butterflies soon. I will be sure to pop on over to your blog! I do want to try it soon. If they look half as good as yours I’ll be happy. Thank you! These are beautiful! The tutorial looks really easy to follow too. I’d love for you to link these up to our All Things Thursday Blog hop when you get a chance. Hope to see you there! Thanks, Nici! I hope you give them a try! Thanks for the invite and I will be sure to pop on over! Connie, I just pinned these. 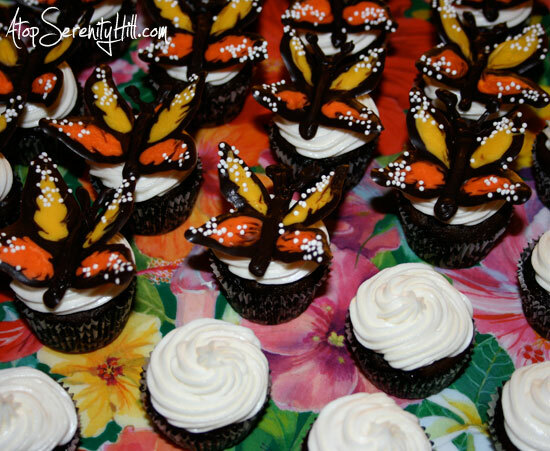 What GORGEOUS cupcakes your butterflies make. My next blog hop goes live Tuesday at 7pm EST. Would you please stop by and share this? It is called Wonderful Wednesday Blog Hop on Ducks ‘n a Row. Thanks, Sinea! I will be sure to stop by. Thanks for the invite! This is absolutely beautiful! You are such an Artist!. I just love those butterflies! Thanks so much for sharing it with us!!! Thanks, Cami! Enjoy your party and thanks for always sending out a reminder! Wow! These are beautiful, Consie! thank you for explaining how they’re made! Great tutorial! Thanks, June! I hope you will give them a try! These toppers are so pretty! I’m not sure if I can pull it off, but I sure would love to give it a try! Thank you for the tutorial! I found your post when it was featured on Inspire Me Monday. These look great! My daughter loves making stuff like this, so I am pinning it to try it with her one day 🙂 Thank you for sharing! Thanks, Missy! I am so glad that you found this doable with your daughter. And thanks for the pin! These are so gorgeous!! 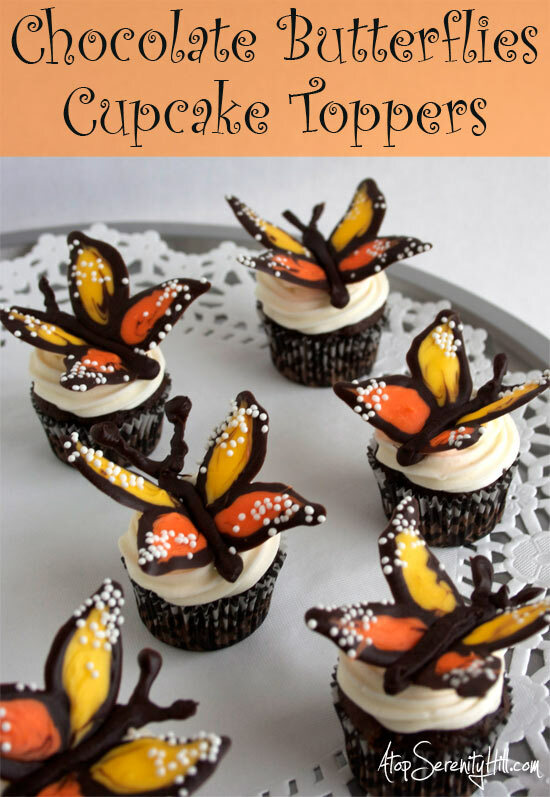 I’ve done butterfly toppers before, but not with the different colored chocolates. Thanks, Adelina! I love that they can be done for different occasions just by changing the colors. Happy Holidays!